Parents came to hear about the grade 2/3 combination! Parents viewed a reading video about how to choose the right book. They also learned how to search for a Reading Counts book. Parents discovered the benefits of educational blogging from class blogging buddies in Australia! Mrs. Yollis Skyped in Mrs. Morris and Miss Jordan who outlined the rewards of blogging. Since it was Friday morning in Victoria, Australia, Mrs. Morris and Miss Jordan were teaching. 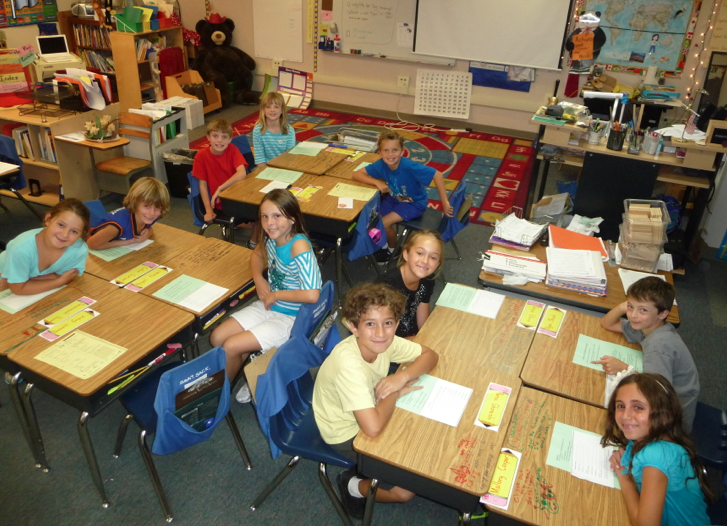 Parents, how is elementary school different from when you were in school? What an honour it was to speak to your wonderful new parents! Educational blogging is something we're very passionate about and we always enjoy introducing families to the benefits. Miss Jordan and I particularly enjoyed the comment about the rugby! Unfortunately, this is a sport we know little about but it was fun to discuss Australia's rivalry with New Zealand. We'd love to hear from any parents or students on the 4KM and 4KJ blog. Miss Jordan, 4KM, 4KJ and I all look forward to working with your students this year. It was a fun surprise for the parents to have such special guests from Australia join our Back to School Night! You and Miss Jordan did a fabulous job sharing the many benefits of classroom blogging. After you spoke, one of the district administrators came in and he had been to Geelong. In fact, he knew about the Wildcats! Yes, organization/organisation is one of the keys to success. I have to be extra-organized this year because of the split class. To help me, I use colors. For example, I have green folders for second grade and yellow folders for third. Do you have any tips that help you stay organized? I hope some parents do drop by your blog and leave comments. It is such fun to get to know one another. What a coincidence that one of your district administrators has been to Geelong! The Wildcats are Geelong's basketball team - another sport I don't know much about, haha. ★ Filing things as I go, rather than letting papers or emails build up. ★ Cleaning as I go so mess doesn't build up. ★ Getting ready for activities in advance, rather than leaving things to the last minute. ★ Writing a to-do list and recording events on a calendar so I remember what I need to do. I wonder if any of your students have any more tips for being organised. Back in the day when I was in third grade things were MUCH different. We had no computers, no skype and everything was done in pencil. School work seemed to be taught at a slower pace and the information was not as advanced. Your students are very lucky that they have wonderful technology to help them and a GREAT teacher to assist them with there learnng. Yes, a lot has change! It used to be that we had to put a letter in the mailbox and wait weeks to connect with someone from Australia. Now, it can be done in an instant. I wonder what else will change in the classroom in the next few years and decades. Thanks for your high praise! I appreciate it! What a fun experience Skyping with you all the way around the world. Funny to think that your day was just getting rolling and I was thinking about going home and making dinner! :) That is, after the fabulous back to school night. 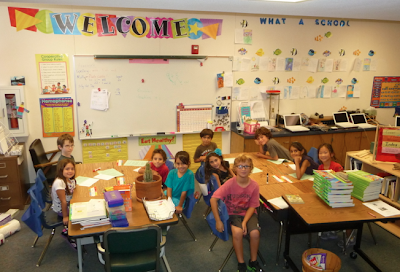 We feel so lucky to be in Mrs. Yollis' class this year. We look forward to having a great year together. I'm glad you enjoyed our international Skype call tonight! Like you, it is hard to imagine that it is already Friday in Australia, but we are just heading for bed on Thursday night. Blogging has so many benefits! I'm looking forward to a fabulous year as well! It really was a pleasure to be in your classroom tonight and to hear about all of the exciting things you will be learning this year. I, personally, am looking forward to learning more about blogging. I look forward to the new instructional video that you will be making. I'm sure Grace will be able to teach me a thing or two about blogging in no time. What a surprise it was to get a Skype call from your blogging buddies in Australia. I'm so happy for you all to be able to connect with students all around the world. Access to the internet and to connecting with other students globally was not part of my third grade education. But we did learn to love reading good books and to work hard. That is something that has not changed. We are so happy to have Mrs Yollis as Grace's teacher this year. Thanks so much for your kind words about my classroom and the year ahead. I look forward to a great year as well! It's always fun for me to get to know the families and watch the learning commence! I'm glad you enjoyed hearing about the benefits of blogging from my good friends and teaching colleagues in Victoria, Australia. No better way to demonstrate how flat the classroom walls can be than a Skype call to another hemisphere! What a world we are living in! I had fun learning about educational blogging tonight. I enjoyed skyping, too. When I was in second grade, I never imagined I could video talk halfway around the world. We used pencils and paper and glue that smelled funny, we didn't even have glue sticks! I love Nate's classroom and its disappearing walls! Thanks for leaving us a wonderful comment and for volunteering to be a Room Mom! We really appreciate you taking responsibility for us this year! Yes, the classroom is changing! When I was in grade school, we did not have glue stick either. In fact, the adhesive of the day was paste. We had these small barrels of paste and the lid had a little stick in it that you could dip into the paste. When the little barrel got low, I would get paste all over my fingers. So funny! 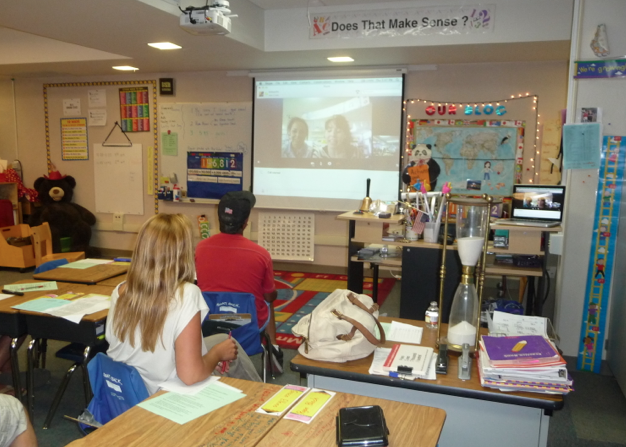 It was really neat to see how Skype could be used in the classroom. Our family has relatives in New York and we use Apple's Facetime (which is like Skype) to see and speak with them. While it is not the same as being there, it helps "flatten" the walls of our respective houses. I look forward to hearing about the other classes that you will be Skyping with this year. I am so glad that you enjoyed learning from our blogging buddies, Mrs. Morris and Miss Jordan, via Skype. Yes, Facetime and Google Hangouts are similar. I was glad the call came in so clearly! Sometimes the sound can be delayed. We will be learning and having Skype sessions throughout the year. I recommend going to the sidebar and subscribing to our blog. After entering your email address, you will be notified each time I publish. 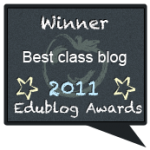 Thank you for such a fabulous and exciting start to the new school year and, to blogging. I was tickled to see our blogging friends from Australia skype in to welcome our families at back to school night. Thank you, Mrs. Yollis, for setting up that pleasant surprise and, to Mrs. Morris and Miss Jordan (and class) for sharing in the experience all the way from Australia. We appreciate the opportunity to share in these global experiences and creative ways to interconnect our classes and families. We look forward to making new connections and building on those that you have offered us through this wonderful blog. Mrs. Yollis's emphasis on staying green is duly noted and very much appreciated. Two examples have been her reminder to us to recycle our school supply packaging and to send us our back to school handouts via email in an effort to save paper. I wonder what recycling and 'going green in the classroom' tips we can get from our globally connected friends in Australia? Does anyone have any ideas on recycling and 'going green' to add to the great list that Mrs. Yollis has introduced? A study has shown that approximately 79% of all waste that is generated in schools is recyclable. Wow! What a great place for opportunities to help the environment! What are some of your ideas for recycling within our classroom and school? What are the benefits of recycling? Thank you so much for your thoughtful comment! I was tickled to have Mrs. Morris and Miss Jordan join my Back to School Night as well! Although we live nearly 8,000 miles apart, we are good friends. 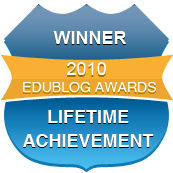 Clearly, there are so many wonderful benefits of educational blogging! I appreciate the fact that you mentioned the steps I have already taken to help with recycling. There is so much waste! Hopefully my students will jump in with some ideas about how we can recycle more in our classroom and in our lives. I feel very fortunate that my grandson, Collin, is a member of your extraordinary class. I know that he will be engaged in active learning all year long and will continue to use the skills he learns from you in the years to come. When I was in school we had very large class sizes, so students sat in long rows and never participated in "group" work. Our teachers taught in front of the class and then sat at their desks while we quietly and solitarily worked on our own. We approached them at their desks or raised our hands if we needed help. We NEVER asked our neighbor for help because our name would be put on the blackboard as a warning and a check added to it each time we made a similar mistake or broke any other classroom rule. The computer had not been invented, so we used encyclopedias (where information might already be out of date) for research projects. Paper and pencil tasks made up most of our "active participation" in class. I personally did like school, but I also could understand why others had such a hard time adjusting to the confinement, so when I became a teacher I made sure my students were more actively engaged with each other and me. That is why I am so happy for Collin to be part of such an exciting learning environment. What do you think are the benefits of being able to work in groups? What do you think are the benefits of working on your own? 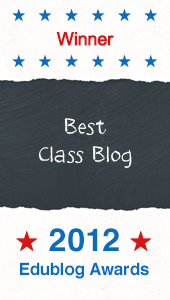 I am looking forward to learning more about your classroom this year and appreciate the opportunity to be able to join via your class blog. Welcome back! I am thrilled that you and Jim will be part of our online learning again. For those new to blogging, I want to tell you that grandparents are a wonderful addition to classroom learning. Here is a post I did about Marsha and Jim from 2010. Like Kendall, Collin is a wonderful student who enjoys learning and helping others. Welcome back to you and your new students for another wonderful year of learning. This is going to be a wonderful year for you all especially blogging once again with your wonderful blogging pals in Australia Mrs Morris and Miss Jordan. I really enjoyed reading this post. Then getting to skype with your pals would have been wonderful. From the photos it was great to see the parents of your students so eager. Boy school has change heaps for when I was at school all we did was learn from text books. Now look just how far we have come with been able to skype, and blog which really brings the world right into the classrooms. This makes for a wonderful way of learning as one. Have a super year of growing and learning from your blogging pals. Thanks so much for joining in our learning again this year! You and Bianca and Mr. Mannell were all mentioned in my Back to School discussion with parents. I shared that our learning community extends beyond the people in the room and that we have lots of friends Down Under! Your vacation seems to have ended so quickly and now I see you're starting another year full of wonderful learning and blogging adventures. It looks like your Back to School Night was a great social event. 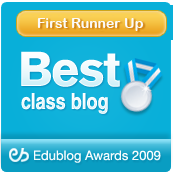 I hope to visit your blog a number of times this school year. 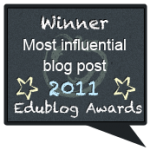 There is so much you can share by blogging and so many student blogs of others you will be able to visit. You might have read my comment above to AA, but you were mentioned during my Back to School Night discussion. I told my new parents that we have wonderful friends all over the world who join us on our educational journey. Thanks for all the contributions, and we look forward to another year of learning together! Wonderful Back to School Night! Hope you have a fantastic school year! Skyping with Mrs. Morris and Miss Jordan in Australia must have been an exciting experience for parents at Back to School Night! Sorry my husband and I missed that! Technology sure allows you to fully realize that it is indeed a "small world after all." Things have definitely changed from my elementary school years. I would never have imagined that talking to another class on the other side of the world was ever to be a possibility. Amazing how far we have come. Mrs. Yollis, I remember that paste glue with a brush attached to the cap. Funny! I also remember chalkboards were the center focus of a room rather than whiteboards. I used to cringe when the chalk scraped the board the wrong way. Also, there was all that chalk dust! The whiteboards are so much better and more versatile. I can't recall, do you have a chalkboard at all? Do any of the classrooms at our school? How about in Australia? Or, are they just plain out of date? We are looking forward to the exciting year ahead in your class. I am excited about being in your class. I am most excited about practicing multiplication, for example 5*5=25 and 15*5=75. Math is my best subject. I think about the problem in my head and I solve it. The video about Lucky Hat Day was great. I am so sad that I missed it but I was at my grandparent's house in Charlotte. If I was there, I would have worn a hat with tubes coming out the side, holding two water bottles. The two tubes would go from the water bottles to my mouth. The video made me happier than I was feeling about missing Lucky Hat Day. I am so glad to be back. There are so many things that are different about school nowadays. When I was in school we had a computer lab, but we could only type words like "hello" and "goodbye". It wasn't much fun. Now you have tiny devices that are computers and can do so much more. In my class, we sat in straight rows and never changed seats. With Mrs. Yollis, you sit in groups and move around at times. I grew up in a city and we were allowed to walk home for lunch. At Chaparral, everyone eats lunch at school. There are so many differences between our schools that I could go on and on. I do remember my favorite parts of the day though. Firstly, I loved math class and second, I couldn't wait to get outside to play jumprope with all my friends. I wonder what the students and other parents' favorite recess activity was.